2012 Update: This could have happened last year, but Banana Cream Pie is off the menu at Breyers. 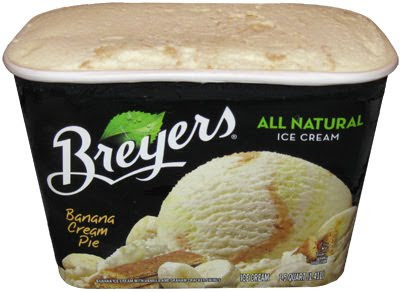 With that being said, if there was anyone who could get me to try a banana flavored ice cream, it's Breyers. No, they aren't perfect, no one is, but I think they nail mellow better than anyone else. They understand ice cream is smooth and creamy, and that includes the flavorings and not just the ice cream itself. I don't want a flavor to beat me down or taste artificial, I just want to savor it. So, here it is. It doesn't say new but I'm pretty sure it is since I'm almost positive I've never seen it before. The exact description of Breyers Banana Cream Pie is Banana Ice Cream with Vanilla and Graham Cracker Swirls. I'm glad it doesn't mention banana chunks because even though I'm tempted by new products, the thought of banana chunks in ice cream would have permanently crossed this one off my list. With a little digging, you will find the curious creation before you. 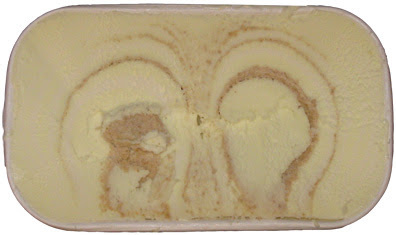 When Breyers says graham cracker swirl, they mean GRAHAM CRACKER swirl. You can literally pull up a corner of the swirl and the whole thing will come up, it's just that thick. On the left hand side you will see a chunk of graham cracker dying to be taste tested. The first bite threw me off a bit as it struck me as rather salty, but it only took a few more bites before I started settling in and appreciating it. Note: this may be the first time since Breyers Sara Lee Strawberry Cheesecake that they've gone with a graham cracker swirl. It's a neat trick they've pulled off here and I truly hope they roll it into some more flavors as soon as possible. Ok, enough stalling, need to talk about the base ice cream here. Is it mild like I hoped? Actually, it is. There's no mistaking it's banana, and it's got a weird funk to it at first, but you get used to it. In fact, I recommend smushing the whole thing together so that the 3 flavors blend the way they were meant to. Unfortunately, this is when I ran into another problem. It's not that the blend tasted bad, it's that the whole time I was eating it, I kept wondering what I should mix it with. My primary suggestion: A scoop of banana cream pie with a scoop of chocolate and a scoop of strawberry might make for an interesting sundae (with whip cream and sprinkles of course). Would I buy this again? No, I just don't like banana that much, but I don't feel like I've wasted my money either. We've got a unique treat here and I'm glad I got up the nerve to try it. Oh my gosh...I NEED to try this! I go (excuse the obvious pun) bananas for anything banana flavored. And I love, love, love graham crackers mixed in ice cream. Thank you for alerting me about this! I loved this ice cream! I really wish they would bring it back! It was scrumdillyumptuous! I think I almost died when I figured out that they discontinued this flavor. I bought so many cartons of this ice cream. I ate so much of it, I usually keep at least 2 in stock stored in my freezer at ALL times. I'd give a lot for them to bring this flavor back. Please bring back this flavor again. I always go and look in different shoprites for this Breyer's flavor. It was so tasty. Why did you discontinue it? ?